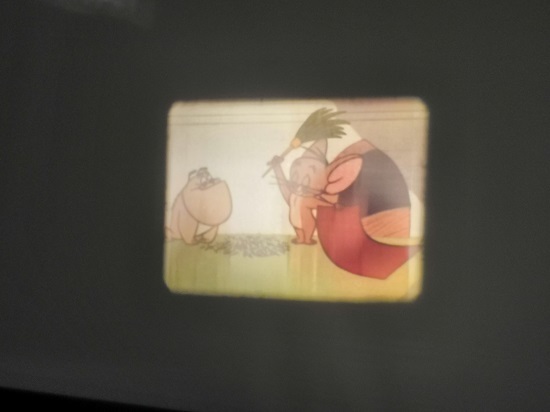 Recently someone offered me a Projector heurtier tri film for 80€, i don't know if it's a good deal but i haven't buy it yet. I'm writting to have a advise from you, collectionor. At the moment i juste have a collection of super8 movie but i don't know if it worth to start a 16mm and a 9,5mm collection (the 35mm also interest me). I don't know what is the advantage of this format and if it affordable ( i'm a student ).I am mostly intrested in 90s movie and more recent one. I don't know if it's reasonable to start collect different format that's why i'm a asking your advise. Pierre, Heurtier is a good make. There are different models of tri films projectors. Be aware of some things to look for. First, earlier models are 110 volts, so you have to find 110 volts lamps. The do surface on Internet (but of course you must add the cost of the postage) or at cine fair (but you must attend them) and of course, you need an adaptor (un dévolteur) to use the projector on the modern elctrical system (still called 220 volts but in reality it's 230 vols now), that something to add to the cost (you need a powerful adaptor since lamps can go up to 750 watts on some models, so not a cheap adaptor used for small sevices like mobile phones for example). To use different gauges (in French, formats), you need to change the gate and the spindles (the sprokets, roues dentées in French, are fixed on the projector and you just need to turn them, depending on the gauge). Needless to say, some projectors are sold without those parts (gates and spindles) so you can only use the gauge that is "ready", unless you can find a separate kit (but then, again, you will have to pay for that. I assume the projector you're offered for €80 is silent so that may not suit your tastes since you say you're intersted in recent films. 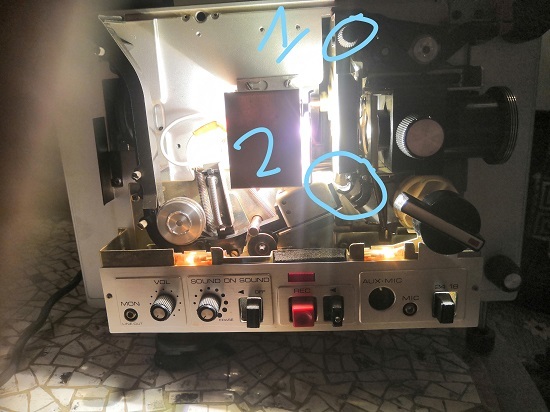 What's more, 8mm (known as double 8 in French) and 9.5 are interested for old films that cannot be found for some titles in other gauges but, as far as I know, there are no films from the '90s in 8 mm or in 9.5. Hi Pierre, Dominique has already told you good things. defects: noisy and heavy, you can run 16mm only mute (there are many sound ones, unlike other formats), it needs at least two different lens. You say you are interested in 90s movies, therefore 9.5mm is not at all suitable for you. 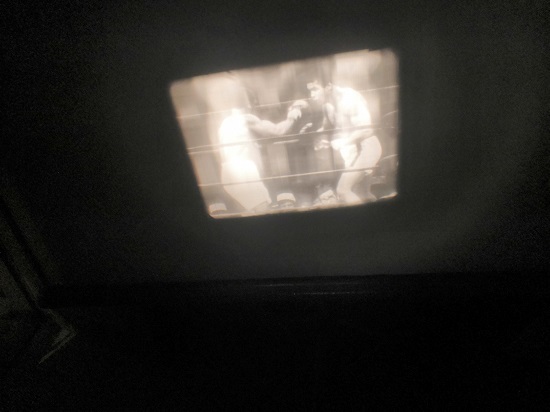 By all means go for a 16mm sound projector, one which uses the easily obtainable ELC lamp. The Heurtier which interests you may only be silent. Thanks for your advises. 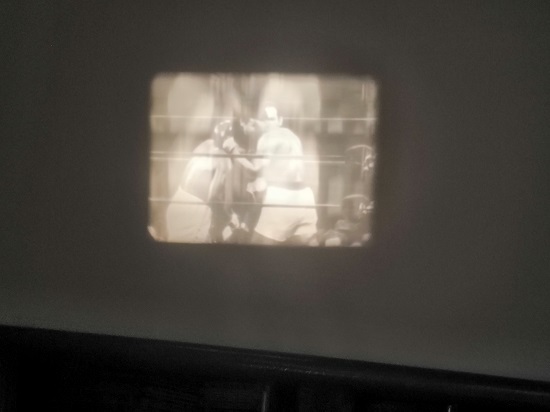 Yes the projector seems very nice and the seller confirm me everythinks is complete (lens, gauge, adaptator,...) but i think it's not for me as i'm not into silence movie or old movie (exepte the chaplin's). And it's more reasonable to focus in only one format. I have the chance to live in a region were the colectionnor are not much so the price are not expensive, so maybe i can find a other opportunity like this if i change my mind. I know the best must be 35mm. The 16mm format have more recent movie ? I don't want to create a another topic like a spamer so i take the opprotunity to ask a another question in this topic. I have a projector chinon sound 8000 and a another revue sound lux 35 but for the two, when i start the movie the image have a problem. Is like there is a ghost in the picture, there is i translucid white filter behind the personnage i don't know what the reason but it a bit upsetting. Someone have the solution ? And reading the different topic on this forum, it seems chinon it's not a good projeteur to see the film or preserve them, so what the reference as super8 projecteur or what model to avoid because need a lot of repair . There are some films from the '90s on 16mm but less titles from that era than for earlier ones. They may be more expensive since there are generally less copies (video had already taken a large part of the market) and colours are good. For your other message, a ghost (I hope in English they use that word as well to name what you described and is called "fantôme"/ghost in French) is usually due to a blade shutter problem but I'm not good enough in technical things to help you with that, I'm afraid. The UKs Paul Foster is a very good source of 16mm films. Thank Dominique, to identify the probleme is already a big step. I will upload a photo later to be more specific. Thank for the site. Effectively after seen the list of the movie available on 16mm and 9.5mm, this format is definitly not for me. I like to collect movie i like and who i can watch over and over without be boring. As promise i post picture of my Chinon 8OOO sound image problem, i post photo from B/W and color movie. Maybe now the problem i was calling ghost issue is more understandable. I have already clean the inside and all the film passageway. wenn i project in 18image par seconde there is no problem, the problem just appears in 24i/s. The photo of the inside , the 1 (gears to moving up and down the image) and 2 (downside passageway) represente the part wenn i am touching them the picture became a bit better. I hope someone have already experience this issue or have a idear of what to do. Not easy to judge from pictures but it may not be a ghost (fantôme) but a "filé" (no idea of what the English word for that could be). If it's that, and since you say you see an improvement when you touch the arrowed parts, it may be a loop problem. Yes i think it's a loop problem, the bottom loop. I pass the Sunday afternoon cleaning the passage way with alcohol, putting WD-40 on springs and removing the excess of grease in the motor. It a bit better. But the problem still exist. Have you some ad ise of what to do? I read on the forum, you can put some bee wax, is it effective? I'm not sure it was a good idea not to open another thread about your problem. Some members who could provide some advices may not read the problem you're facing with your Chinon since they are not interested on the Heurtier subject.